"Easy CAD Software for Everyone"
If you are looking for a simple CAD program to use, to create professional looking drawings quickly (and with an easy learning curve), you are in luck. Simple CAD software can be found across the net and downloaded right to your computer. Some of these CAD programs are low cost and many are even free. Depending on what you are looking to create with your computer-aided drafting program, most CAD software package prices can vary widely. But for those looking for relatively low-priced simple CAD software, we recommend the easy to use (and learn) CAD drafting program Smartdraw. With this user friendly CAD software program, you can create floor plans, free hand drawings, as well as use it for various business applications. You will also be able to create flow charts, generate various business graphics and charts, produce mind maps, fashion family trees and much more. This simple drawing program also comes with a generous selection of clip art that is easily inserted into the prefabricated templates that are provided with the program. The great news about this simple CAD software is that it is available for free for 30 days for you to evaluate. Smartdraw's website also has written and video tutorials to get you up to speed with their software fast. Another simple CAD program to consider is AutoCAD LT. 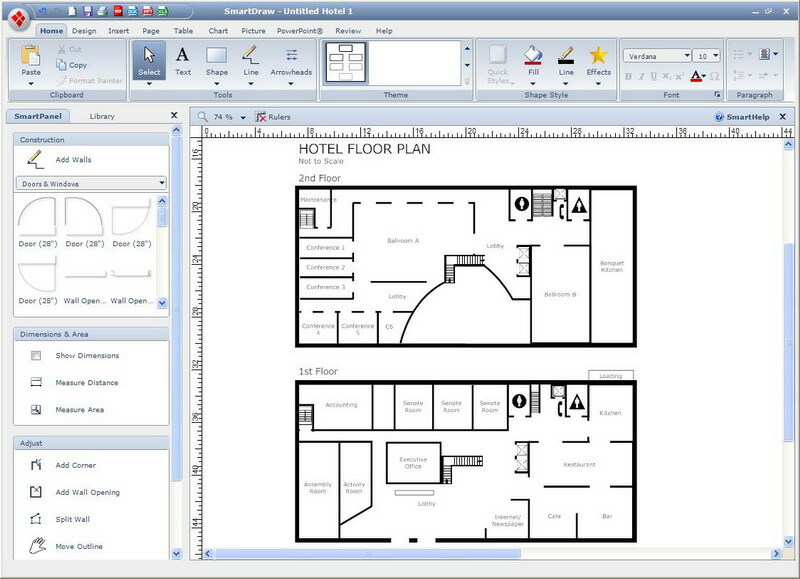 It is a much more powerful CAD program than Smartdraw, but significantly more expensive. However, AutoCAD LT's big brother CAD program is full blown AutoCAD. A top of the line CAD software, AutoCAD is the most frequently used computer assisted drafting program in the world. With that said, AutoCAD LT contains many of the 2 dimensional features that are included with AutoCAD, so you know you are getting everything you need to create an assortment of professional CAD drawings. AutoCAD LT is also available as a trial download, good for 30 days. And lastly, another good simple drawing program to use is SketchUp. Created by Google, SketchUP is a free CAD program that has an excellent 3D user interface. You can basically create your 2D plans and "sketch-them-up" into 3D. Their is also a paid professional version available, but the free SketchUP program will satisfy most beginner needs. This easy to use CAD program is fun to create drawings with and is definitely worth a looking at, considering it is absolutely free.